Fort Worth, TX…The National Multicultural Western Heritage Museum will open the doors of its new home located at the Cobden Building, 2029 North Main Street in the Historic Fort Worth Stockyards and Exchange District on Thursday, August 30, 2018, at 12 Noon! 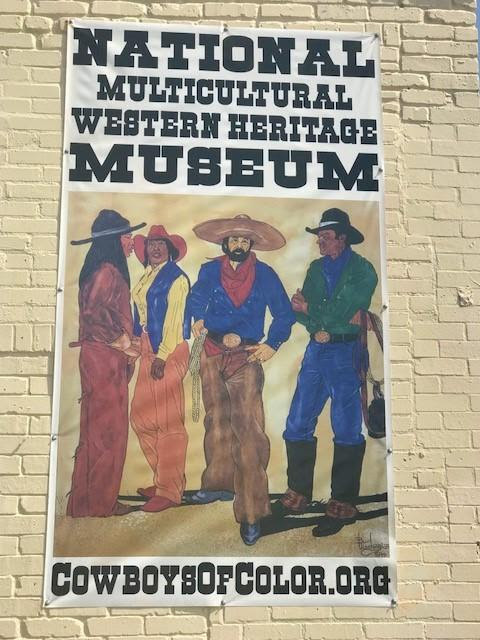 The museum houses pieces of memorabilia, artifacts and historical documents celebrating men and women of all ethnic backgrounds who worked to settle the Old West as well as offering traveling exhibits, educational workshops, volunteer opportunities and family-friendly activities throughout the year. The new location boasts 8000 square feet of occupiable space. The museum will be housed on the bottom floor encompassing 4000 square feet of the facility. Jim Austin, Co-Founder of the National Multicultural Western Heritage Museum, says the new location will be a tremendous asset for both the museum and lovers of the rich cultural history of the city of Fort Worth, “Moving the museum to the Historic Stockyards and Exchange area makes us more relevant to the history of the West and falls in line with similar museums and establishments around the country. With over 2 million individuals visiting the Stockyards annually, we anticipate a huge increase in traffic for the museum, and we are delighted to be in a position to share the incredible contributions of cowboys and cowgirls of all races with many more people.” Museum Co-Founder Gloria Reed Austin will continue to serve as the Executive Director. The Museum’s 2018 Board of Directors includes Executive Committee Members James N. Austin, Jr. (President), Victor Wallace (Vice President), Netra Fitzgerald (Secretary), Saul Waranch (Treasurer), Steven Heape (Director Representative), Gloria Austin (Executive Director) and Directors Mark Lucas Kelly, Sylvia McElvy and Shannon Reese. Formerly located at 3400 Mount Vernon Avenue, the National Multicultural Western Heritage Museum has been committed to its vision of giving recognition to the outstanding pioneers who played a role in settling the early American western frontier since its founding in 2001 by Jim and Gloria Austin. The museum’s Hall of Fame also acknowledges individuals that have contributed to the western culture and tradition who still play a part in keeping this important piece of American History alive. The Museum partners with many organizations within Tarrant County such as Visit Fort Worth; and, is a member of various chambers of commerce, museum associations, councils and organizations within Fort Worth. The National Multicultural Western Heritage Museum (NMWHM) (formerly the National Cowboys of Color Museum and Hall of Fame), a non-profit 501(c)(3) museum located in Fort Worth, Texas, documents the many positive accomplishments that multicultural cowboys and early frontier pioneers contributed to the settling of the western United States, through exhibits, workshops and lectures for youth and adults as well.